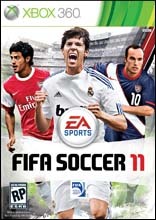 EA announced that Los Angeles Galaxy star Landon Donovan has been selected as one of the cover athletes for EA SPORTS FIFA Soccer 11. The 28-year-old American soccer star will join Real Madrid's Kaka and Arsenal's Carlos Vela on the cover of the latest installment of the popular soccer vigeogame, which is slated to hit store shelves September 28th. Donovan is appearing on the cover of the most popular sports video game franchise in the world for the third time. He was also on the cover of FIFA Soccer 2003 and FIFA Soccer 07 in North America. This will be first appearance for Kaka and Vela. “Landon is the most recognizable, popular and accomplished soccer player in the United States and he was at his best with the world watching during the 2010 FIFA World Cup™," said Matt Bilbey, Vice President of Soccer, EA SPORTS. “After his FIFA World Cup performance and the season he had with the Galaxy last year we felt he belonged back on the cover of FIFA Soccer 11." Building on the FIFA Soccer 2010 gameplay that won 50 sports game of the year awards, the 2011 installment reinvents player authenticity – on and off the ball – for every position on the pitch. All-new Personality+ sees individual abilities reflected in game, allowing clear differentiation for every player. FIFA 11 also introduces new Pro Passing, where pass accuracy is determined by a gamer's ability on the control pad, and player skill, situation and urgency on the pitch, and 360° Fight For Possession, which delivers true freedom in man-to-man interactions, transforming physical play from individual lateral jostling to full 360° collisions involving multiple players. PS3 FIFA SOCCER 09 10 12 13 GAMES MINT CONDITIONS.